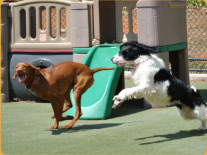 Opening and running a pet care facility can be a daunting task. Amanda can help. Helping other dog daycare owners get started, and run a successful business, is a passion for owner Amanda. Take a look at the consulting services she offers at www.doggiedaycareconsulting.com.